This blog post is the result of a collaboration between Australia based developer of patent search and analytics software Ambercite and Kenedict Innovation Analytics. As Australia starts to look beyond the recent mining boom to see what is next on the horizon, it obvious to many that innovation and technology will be a key part of its future success, and that a key part of this is increased collaboration between the different parts of the economy. The Australian Technology Network has been on the front foot on this, releasing a report in March 2015 claiming that Australia ranks just 29th out of 30 in the OECD in terms of the proportion of businesses collaborating with universities on innovation. Collaboration though is not just between universities and companies – it can be between any type of organisation, even within a company. And it can be very worthwhile, with a 2014 report commissioned by Google estimating that collaborative companies are worth $46 billion per year to the Australian economy. But how exactly is Australia doing right now in innovation and collaboration? Where is it strong? Where are Australia’s best areas of innovation? Who is collaborating with whom? This analysis is based on patents filed by Australian innovators in the last five years. Most serious innovators filed patents, and so patents can be an excellent proxy of innovation, and in areas where data is otherwise very difficult to get. A static map is provided that provides an overview of what areas were patents filed in recent years. Further details are provided of four of the leading areas, being Biotechnology, E-Commerce, Medical Devices and Sports. These details are provided in fully interactive maps as well. Having shown all of the patents filed in these areas, we then provide a final map showing the central network of collaboration in Australia. 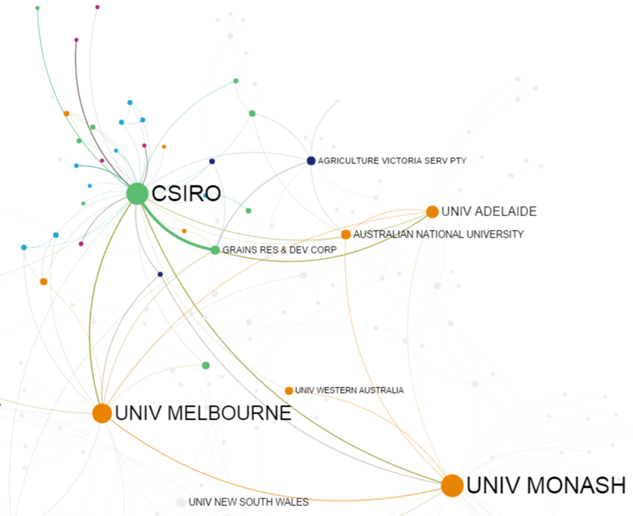 CSIRO is a major player in this network, but it includes links to many of the leading universities and companies big and small. To get a view on innovative activity in Australia, we started by compiling a dataset containing all patent applications published between 2010 and 2014 listing Australian applicants. The data originates from the European Patent Office’s patent database, which contains patent data from over 90 countries. We focused on patent families, where a patent family is where the same patent is filed in more than one country, to avoid double-counting unique inventions in the final analyses and visualizations. Subsequently, we further cleaned and enriched the data by combining applicant names (for instance identifying ‘CSIRO’ and ‘Commonwealth Scientific and Industrial Research Organisation’ as the same organisation) and adding organisation types (Corporate, SME, University, Research Institute and Government). The final dataset consisted of 12,774 patent families. We then applied the principles of Social Network Analysis to analyse and visualize Australia’s innovation hotspots and associated collaboration networks. Network analysis focuses on the mapping of actors and their relationships in a specific context – in this case, the context of technology and innovation. Networks consist of nodes (here, patents or patent applicants) and edges (connections between patents or applicants) and can be analysed and visualized using a wide variety of indicators and interactive maps. A significant advantage of this perspective in the context of innovation is that it allows gaining insight into the relationships between technologies and organizations, which can serve as a basis for a renewed look on Australia’s innovative activity over the past five years. To get a first visual overview of innovation hotspots in Australia, we constructed a map including all interconnected technology areas based on patenting activity over the past five years. Patents list technology classification codes on their front pages, which are assigned during the examination process to make it easier to locate the patent at a later point in time. We can use these classifications to connect inventions and show clusters of related technology in Australia. For instance, when two patents share a classification code related to a specific technology field, we can assume that these patents at least partly overlap in their underlying technologies. Using this perspective, we can build a network consisting of patents which share one or more classifications. This allows us to visually obtain answers to a wide variety of questions: Which technologies dominate the Australian technology landscape? How are technology areas connected, and which organisations have leading roles within these clusters? Are there up and coming technology areas which may become more important in the near future? The map above shows the largest interconnected component of technologies, consisting of 9,231 patents and over 125,000 connections between them. Colours were assigned to patents to show clusters of activity in the network. We examined the contents of each cluster and added relevant technology descriptions and key organizations to the map as well. Australia’s innovation hotspots and related organisations can be distinguished directly from this map. The largest cluster by far is Biotechnology (bottom left hand corner), which consists of various sub-clusters and key activity by various universities, CSIRO and CSL. At the top of the map, we see the medical technology leaders Cochlear and Resmed operating in relatively secluded clusters, suggesting that they are alone within their spheres within Australia. We also see gaming technology companies Aristocrat and Ainsworth, which share the green cluster at the bottom right (Aristocrat was founded by Lens Ainsworth, who later left the company and founded Ainsworth). Silverbrook, which dominates the cyan cluster at the bottom, mostly focuses on inkjet/print head technology. Next to this, we see various clusters of interrelated technologies which are not necessarily dominated by one or a few organisations, but which help to connect the other clusters of activity. The E-Commerce cluster consists of a wide variety of technologies related to online shopping, advertisements and consumer interaction technology; the sports equipment cluster contains all kinds of inventions related to exercise devices and golf; and the contents of the medical devices cluster mainly relates to all kinds of diagnostic and imaging technology (outside of the aforementioned Cochlear and Resmed). The app provides the opportunity to click, zoom and pan around these networks and draw further conclusions. Each patent in the clusters is sized by its Amberscore value, which predicts the likely commercial importance of a patent based on the number and strength of its forward, backward and indirect citations. This can help suggest the importance of a patent and aids in visually determining the most important patents in these clusters. The different colours in these maps show areas of related activity, which relate back directly to the main map showed above. When using these maps, please note that the Biotechnology cluster may take a few seconds to load due to the large amount of data. Clicking a patent shows its direct connections; clicking white space again returns to the full network. Further information regarding each patent can be found upon click in the right-hand pane; the search box can be used to locate specific patents based on keywords. A full-screen version of the app can be opened by clicking the button right next to the zoom buttons. Practically this allows these patent owners to identify potential partners for collaboration. In this case the Tenodesis patent is owned by Lumaca Orthopeadics, a company based in Melbourne. Lumaca appear to be in the same technical area as the patent titled “Prosthetic menisci and method..’, which is filed by Prosthexis Pty Ltd, a company based in Romsey, which is just outside of Melbourne. The map and interactive visuals in the previous sections provide a strong overview of Australia’s key technology areas and the relationships between them based on overlapping technology classifications. 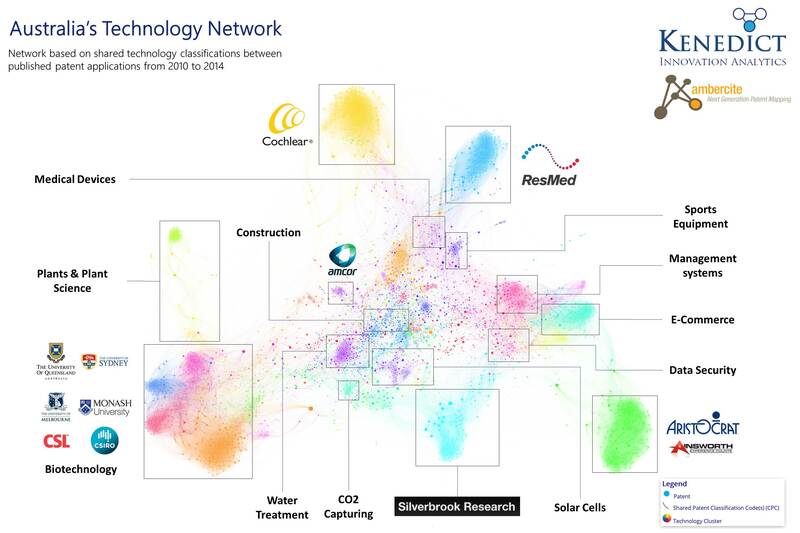 Although many of the clusters were directly relatable to activity by one or a few innovators, the map does not show the actual collaborations taking place between organisations (instead showing areas of shared activity). Especially in light of the recent interest in further stimulating partnerships academia and industry, this warrants further interest. We used our modified applicant data to construct a network of all patent collaborations (patents shared by more than one applicant) between corporates, small- and medium-sized enterprises, universities, research institutes and governmental bodies. This provides a unique glimpse into the actual state of innovation collaboration in Australia, by showing key players, their influence in terms of patenting activity, and the intensity of their collaborations with others. Another well connected applicant is the University of Queensland. The strongest connection from the University of Queensland is to Syngenta of Switzerland. By looking up patents jointly owned by the University of Queensland and Syngenta, it becomes clear that these patents are predominately around the treatment or pre-treatment of sugar cane, an important crop for Queensland. 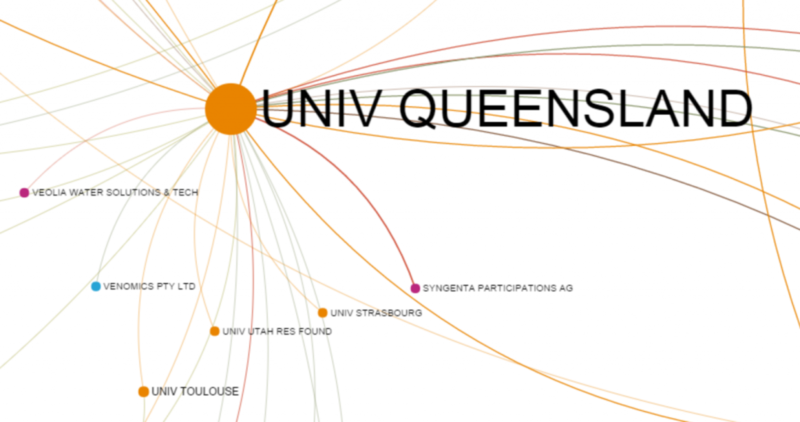 However, this strong connection to a big corporate (Syngenta) is relatively rare – instead the majority of connections in the collaboration map are between universities, other universities and research institutes. There is nothing wrong with these collaborations per se, except that universities and research institutes are less likely to be able to commercialise the inventions they produce. This is in contrast to the general capability of large corporates to successfully commercialise new ideas (even if not all such commercialisation is successful). Some of these areas represent Australia’s traditional strengths (‘Plants and plant science’), other areas are well known in Australia innovation circles (Biotechnology, Cochlear, Resmed, Silverbrook) while other areas of strength show that Australian innovators are working in what could be the key technologies of the 21st century (E-commerce, CO2 capture and solar cells). Perhaps the most surprising omission from this map is mining. While the Australian mining industry can be a great innovator, they do not appear to be filing many patents to reflect this. The value in this sort of analysis is that Australian companies can identify other Australian companies working in this same space, and therefore potential opportunities for collaboration. Next to this, the map shows how various technology areas are connected to each other through other clusters of technology, which provides insight into how technologies can be combined to generate new potentially interesting ideas. On the country level, maps like this one can provide a new perspective on Australia’s innovation strengths – with some good examples being the clusters mentioned in the list above. And there is certainly scope for more collaboration. A map showing direct collaboration in Australia showed that this collaboration was predominately between research organisations (lead by CSIRO) and other research organisations and universities. Although various Australian and international corporates and SMEs also appear in the network, they do not hold central positions and are often connected to just one or a few research organisations or universities. This is indeed an indication that collaboration between businesses and public research organisations could be improved in Australia, further corroborating the results of the Australian Technology Network’s recent report.